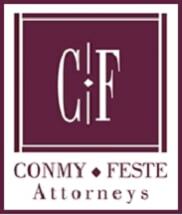 Conmy Feste Ltd. is an established Fargo law firm serving clients throughout Fargo-Moorhead, and across North Dakota and northwestern Minnesota. Established in 1879, we are the oldest operating law firm in North Dakota and have helped generations of clients achieve their legal goals. Because of our breadth of practice areas, and deep knowledge and experience within each one, we are able to serve the needs of clients with multiple and overlapping legal concerns. Each of our attorneys has significant experience within his or her area of practice. We are seasoned trial lawyers who have practiced extensively in state and federal courts throughout the region. We place a high value on client service, devoting time, attention and a commitment to results to each and every person or business we serve. Our lawyer will work with you closely to help you explore your legal options and guide you to the most successful possible outcome. To learn more or to schedule your free initial consultation with one of our attorneys, please contact us online or by telephone at 701-353-0454. Conmy Feste Bossart Hubbard & Corwin Ltd.